A day after Hennessy Artistry's press conference, the event we've been waiting for kicked off over at Malaysia International Exhibition & Convention Centre (MIECC) at Mines Resort City. Like every other Hennessy Artistry events, we had the games outside, which I will not be elaborating on. 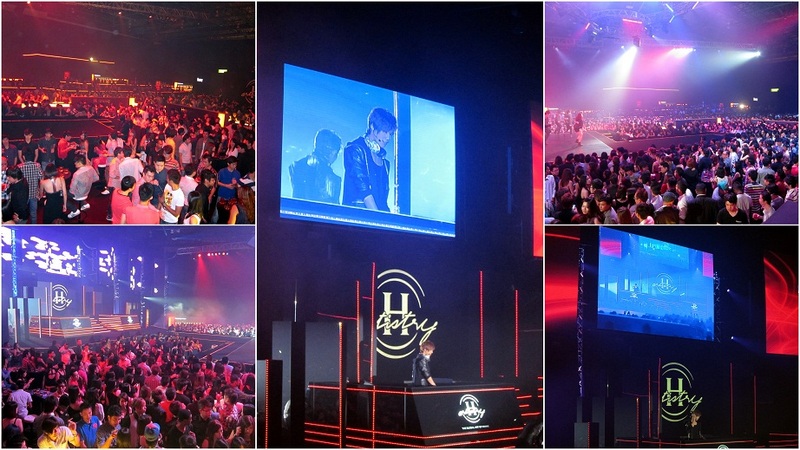 Check my previous post on Hennessy Artistry for a closeup of the games (Hennessy Artistry Mist Club). It was a loud, awesome music extravaganza, with numerous international artist performing that night. The big names performing in Hennessy's biggest party of 2011 consisting of Chris Willis, Yolanda Be Cool, Landy Wen, Park Jung Ming, DJ Goldfish and Blink rocked the night away. There were literally a sea of party goers who flooded the whole area of Hennessy Artistry Halo 2011 that night. The crowd going wild for one night of Hennessy! Miss Universe Malaysia's Ladies Arriving at Hennessy Artistry! We arrived as bloggers at Hennessy Artistry and they were so kind as to reserve one whole section with sofas and tables for us to party the night away. Hennessy mixes consisting of Hennessy Berry, Hennessy Ginger, Hennessy Apple, and Hennessy Soda were served the whole night. If you can take it, you can go all out and drink glasses after glasses of Hennessy! It was a good night, and being bloggers in a party, we did what any blogger would do, snap countless amounts of photos, drink and dance the night away. It was all good, as can be seen from my compilation of photos I managed to capture that night. There are more photos which I have uploaded at my Facebook Page (http://www.facebook.com/isactanjs) For now, do check out the bloggers that attended Hennessy Artistry's biggest party of 2011! Overall it was a good night, with the party continuing on until 2am. I did not stick until the end though as I have work the next day. Great times with fellow blogger buddies, and I'll be looking forward to more events such as this. Too bad I missed u out when I was in the zone.. ANyone get drunk on the night? Looked like one awesome night! Wow!!! You all had so much fun... Cheers! Saw on Facebook jfook's not feeling too well after that. Anybody got stoned drunk? Not you, I hope... LOL!!! Looks like everyone was having a good time.. YAMMMMMMSINGGGGGG! Great event right??? ?/ But you left early, WHY NO BRING JANICE!! Garghhhhhh!! !